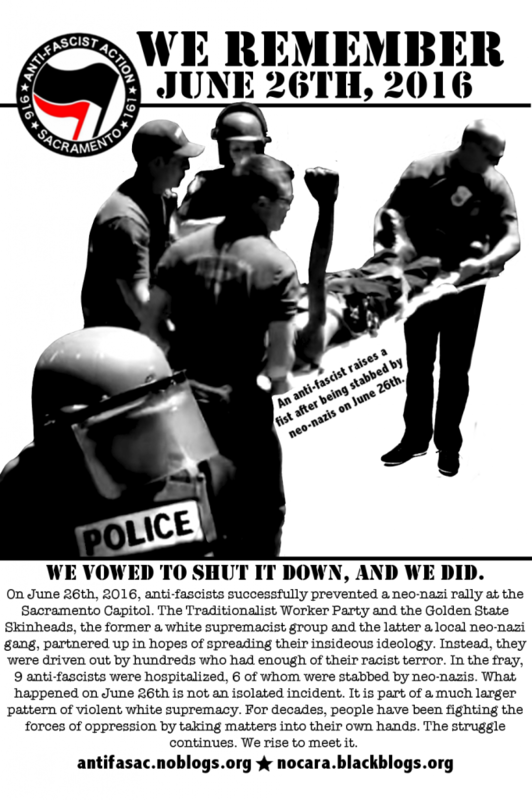 Join us in remembering the events of June 26th, 2016, when anti-fascists bravely prevented white supremacists from rallying in Sacramento, California. Despite a massive police presence and near-deadly stabbings by neo-nazi skinheads, people from all over Northern California held it down and ran the fascist scum out. Now, a year later, we are releasing a poster ready for you to download, print and distribute in commemoration of that day. We honor the sacrifices of the past and look to the future with resistance and determination in our hearts. Together, we will continue to fight fascism and oppression. The struggle is far from over. In unyielding solidarity with those working to expose and oppose fascism across the country and around the globe. We stand with you. This entry was posted in General and tagged June 26th 2016. Bookmark the permalink.